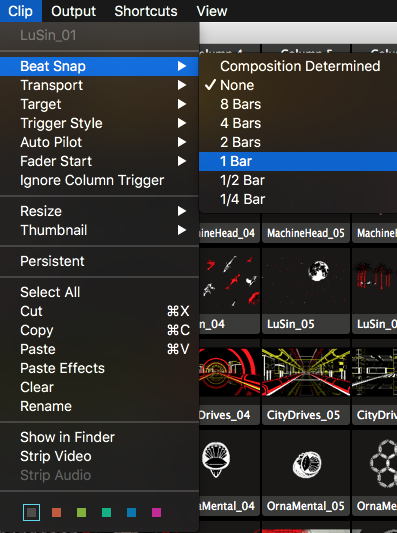 Clips are the real nuts and bolts of Resolume. Without clips we wouldn't have any content to throw at the screens and speakers. A clip is usually a video. But it can be a lot more than that. A clip can also be a still image. It could also be an audio file, or even a combination of audio and video. Clips can also contain Sources - like a live camera or plugins that generate content on the fly. Basically a clip is any type of media you create your output with. Triggering a clip is as simple as clicking its thumbnail. When you're sick of a clip, you can either trigger a new one in its place. Or press the big X to the left of the layer to eject it. That's it. That's really all a good VJ does. Trigger the right clip at the right time. You can now stop reading the manual. Still here? Cool. Because there are loads of options! A column is a vertical set of clips. You can trigger multiple clips at the same time by triggering the column. This is a great way to quickly switch looks by triggering a set of clips that work well together. You can change how individual clips respond to a trigger. Tip! Want to change a setting before a clip is live? No problem. You can select a clip, rather than trigger it, by clicking the name handle underneath the thumbnail. Bonus Tip! All the functions described below can can be changed for multiple clips at the same time as well. Shift select the clips, and then change the function via the Clip menu or the right click drop down. You can use the Beat Snap option to have clips wait until the next beat, the next bar, in 2 bars, in 4 bars and so on before it starts. This is particularly useful for audio-visual music clips. In some music software, this feature is known as "Quantising". You can set the Beat Snap option for an individual clip. Select the clip and select the Clip > Beat Snap menu option. If you set the clip setting to 'Composition determined', it will use whatever the Composition setting is. You can set the Beat Snap option for the whole Composition through the Composition > Beat Snap menu options. The default thing that happens when you click a clip is that it plays on the layer it is held in. 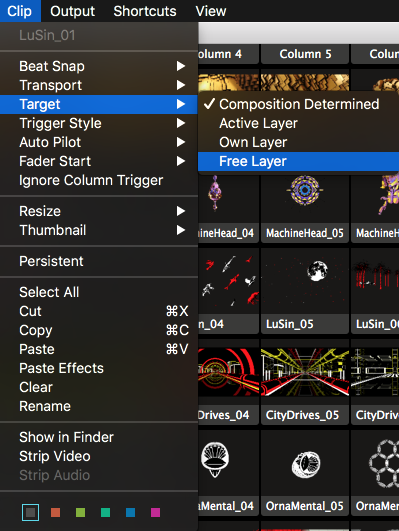 You can also set clips to play in the active layer or even to use the next available layer. 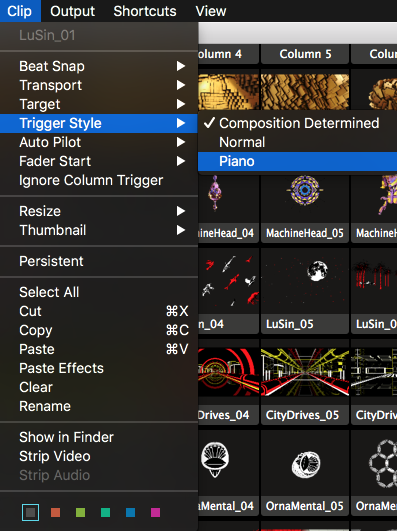 The Free Layer Clip Target mode is particularly fun when used with the Piano Trigger Style mode (see below). You can then play 'chords' of clips with the keyboard or a MIDI device - each of them will be displayed for as long as it is selected. Obviously, you will need as many layers as you want to play simultaneous clips. Normally, when you click a clip, it starts playing and carries on until you clear the layer or play another clip. With the Trigger Style setting, you can also use Piano mode, where the layer is automatically cleared when you take your finger off the mouse button, or MIDI key or keyboard button if you are using shortcuts. You can set the Trigger Style for the whole composition through the Composition > Trigger Style menu option. You can set the Trigger Style for an individual clip by selecting it and then using the Clip > Trigger Style menu option. Using the Auto Pilot, you can let Resolume automatically play a different clip when the current clip finishes. Options include the next and previous clip, a random clip, the first or last clip in a layer, or even a specific clip. You can also turn on the Auto Pilot for the whole layer. Handy for that quick bathroom break. Or when you need to explain that you're really not the DJ to that one person that won't stop requesting that new banger by DJ Snake. When Fader Start is enabled for a clip or a layer, the clip will re-start from the beginning every time you fade up the layer it's playing in. This is useful for clips that should start exactly from the time you bring them in, like song lyrics or intro animations. You can keep them triggered in a layer, ready to go, and when the moment comes, start them by fading them in. Tip! In combination with the "pick-up' playmode (described further below), you can also turn this feature into a Fader Stop. The clip will then remain paused where it was the moment you fade down the layer, and continue where it was when you fade it back up. 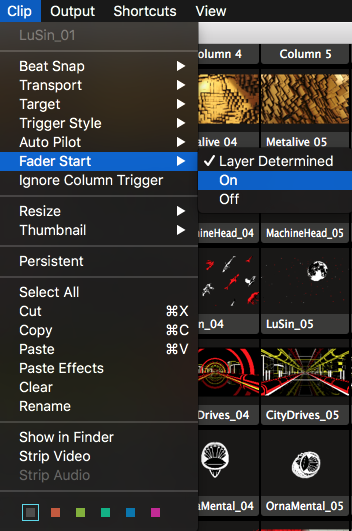 Fader Start can be set per clip (Clip > Fader Start), or the whole layer (Layer > Fader Start). This option allows you to 'lock' a clip or entire layer, so that when you trigger another column, that particular clip will not get replaced and just keeps playing. The option can be found in both the Clip and Layer menus. This is particularly useful when using a single clip as a background, or when you are using Resolume to record a video clip, and you want to keep playing a single audio track while you're mixing. Here you can quickly set your clips to either Fill/Fit/Stretch to the current compositions size, or go back to the original pixel dimensions. This is not a setting that stays fixed! Rather it's a quick way to make sure all your clips are the correct size, and you can go into the clip properties and further tweak the values. Not sure what Fill, Fit and Stretch do exactly? They're explained below, where we talk about the Clip Properties in greater detail. Oh yes! You can update the thumbnail of a clip to the current frame, or even to how it looks with the clip effects applied. If you're really picky about your thumbs, you can even load a still from disk. Not happy how your thumbnails turned out? You can always revert back to the original. Persistent clips carry over from deck to deck. You can mark one or more clips as persistent via the Clip menu. When you then switch to another deck, these persistent clips will be loaded in the same slot in every deck you switch to. This is useful for longer shows, where you always want to have access to a particular set of clips, but not be tied down to a single deck. Promotor logos, flashes or live cameras come to mind. Did you have an important clip in a deck, which is now covered by a persistent clip? Don't worry! Resolume will let you know there was another clip in the slot by showing it as a little thumbnail in the top left. You can use this thumbnail to free the clip. Just by dragging it to an empty slot. If you really don't know what CTRL-c and CTRL-v do, I suggest sitting down with a good friend and asking him or her to show it to you. Also, props to you because I wouldn't have made it through college without copy/pasting stuff from people that were smarter than me. One option that may stand out is 'Paste Effects'. This will let you copy a clip into memory using CTRL-c, and then paste just the effects onto one or more other clips using Paste Effects. This feature may be familiar to you from good old Final Cut Pro and it's a really quick way to get the same look on a set of clips. These will show the original clip in Finder or Explorer, or let you strip the audio or video track from a clip. Careful! Removing the video track when there is no audio track will effectively delete the clip! Don't say I didn't warn you! Yes! You can now give each clip or set of clips its own nice pastelly highlight. The clip properties give you important info about the clip. Geeky stuff like the codec and fps, but also useful stuff like the length and default BPM. When you toggle down the individual audio and video properties, you get access to some more finetuning options. The audio properties are only visible if your clip has an audio track. Duh. Use the X button to delete the audio track. You can use this to remove the audio track from a video if you do not need it. Using the audio properties, you can set the volume for this clip individually. This is useful for balancing the volume of clips that will play on a layer. Also, you can pan this clip individually. Tip! Drag a video clip from the browser over the blue video area. This allows you to replace the content, but keep any effects and parameter changes you had applied to the original! Use this bad boy to resize the clip to the size of the current composition. This is great when your content isn't at the right size already. Clicking this multiple times will cycle through a few options available for scaling. Fill. This will make sure the clip fills the entire composition, while maintaining its aspect ratio. This will result in the sides or the top and bottom of the clip being cropped off. Fit. This will make sure your clip is completely visible, while maintaining its aspect ratio. This will result in black borders being visible on the sides or top and bottom. Stretch. This stretches the clip to the composition width and height, distorting the clip when necessary. Original. This returns the clip to its original size. Click this to clear the video from the clip, leaving the audio intact. U se the RGB toggles to subtract colour channels from the clip. Using combinations of these, you can quickly colorise a clip to the three primary Red, Green and Blue, as well as the secondary colours Cyan, Magenta and Yellow. The A toggle can be used to disable transparency in a clip. This will only be available if your clip has an alpha channel in it. When you fold open the extended properties, you get access to Opacity, Width & Height, Blend Mode and Alpha Channel interpretation of a clip. This will fade out the visibility of your clip, gradually fading it to black. Here you can change the resolution of the clip using exact pixels. This will let you set which blend mode this clip uses when it's playing in a layer. This will override whatever blend mode you have selected on the layer, for as long as this clip is playing. Here you can tell how to interpret the alpha channel information in your clip. Resolume will default to "Premultiplied". This is the default setting that After Effects uses for exports with an alpha channel. So most of the time, you don't even have to worry about this. Are you seeing a weird halo around your edges? Then you probably want to switch to "Straight".